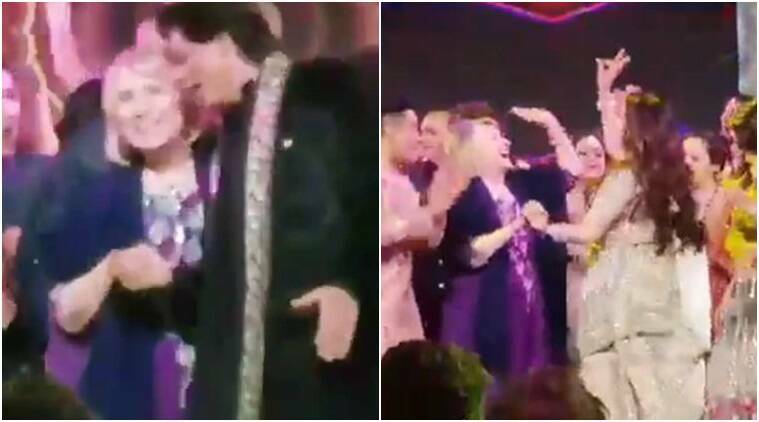 Grooving to the beats of popular Bollywood tracks such as ‘Lets Nacho,’ ‘Abhi Toh party shuru hui hai,’ ‘Tune Marri Entry,’ Hillary Clinton along with former US Secretary Of State John Kerry was seen shaking a leg with Shah Rukh Khan and Nita Ambani. The sangeet ceremony of Isha Ambani, daughter of industrialist Mukesh Ambani, was a grand event which included a star-studded guest list and power-packed performances. Isha will tie the knot with Anand Piramal. From Bollywood’s Shah Rukh Khan to American singer Beyonce, the guests saw it all at the sangeet ceremony. However, a video of former US First Lady Hillary Clinton, who attended the ceremony at Udaipur, has gone viral. In the video, Clinton along with former US Secretary of State John Kerry can be seen shaking a leg with Shah Rukh Khan and Nita Ambani. They were seen grooving to the beats of popular Bollywood tracks such as ‘Let’s Nacho,’ ‘Abhi Toh party shuru hui hai,’ ‘Tune Marri Entry,’ and more. The video, shared by Twitter account @Mahanatiii, has created quite a buzz on social media with over one lakh views at the time of writing.